Thousands of Garth Brooks fans were left in the dark after the power went out during a country music concert at the Prudential Center in New Jersey Sunday night. Arena officials said the brief outage occurred at 7:50 p.m. during an opening act's performance at the downtown Newark venue. 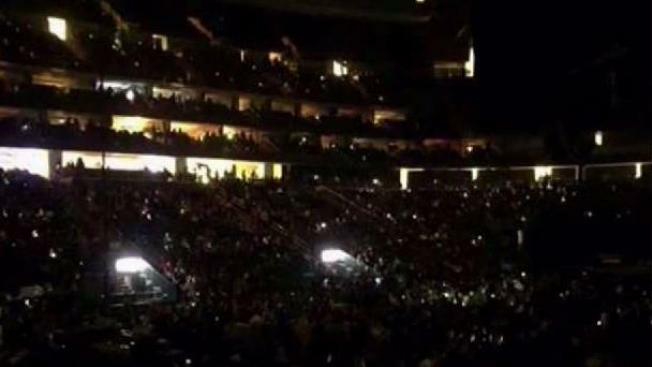 Concertgoers posted photos and videos of the darkened arena to social media. "And there is a power outage," Heather Zwillenberg wrote on Facebook along with a photo of the blackout. “Power outage @PruCenter in middle of @garthbrooks concert leaving thousands of fans in the dark,” Briana Vannozzi said on Twitter. Twitter posts showed fans in the nearly 20,000 seat arena singing "Friends in Low Places" as the lights gradually returned, but before Brooks’ band hit to the stage. Arena officials said the power was restored a short time later and the show went on as scheduled. PSE&G said it was investigating the cause the outage, according to spokesman Andrew Wesley.